At LSBU, we pride ourselves on the employability of our graduates. Our courses are designed and delivered by academics with practical experience and understanding, and we use our excellent contacts in a variety of industries to make sure we are providing our students with the skills that their respective industries are crying out for. If it sounds like a complex set of skills and responsibilities, that’s because it is – but Davit feels that his degree at LSBU was instrumental in preparing him for exactly the kind of challenges he has faced since starting his career. Davit was also successful in securing a one-year placement after his second year, and credits LSBU’s Employability Service with helping him to secure it – as well as supporting him in improving his CV and preparing for interviews. The LSBU Job Shop was very useful - I applied for placement and internship posts, and volunteered part-time in IT during my second year, which was a useful addition to my CV. 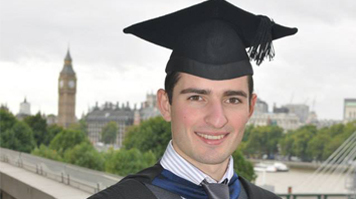 Read more about studying BSc (Hons) Applied Computing at LSBU.